The market is flooded with Cauliflower and very reasonably priced. Bought two large heads for Rs.20/-, cut them into florets and used a portion to prepare Gobi Manchurian. I’ve received requests to blog Indo-Chinese recipes especially appetizers. So, I decided on this colorful and vibrant cold-weather appetizer or snack, much loved by Indo Chinese fusion food connoisseurs. 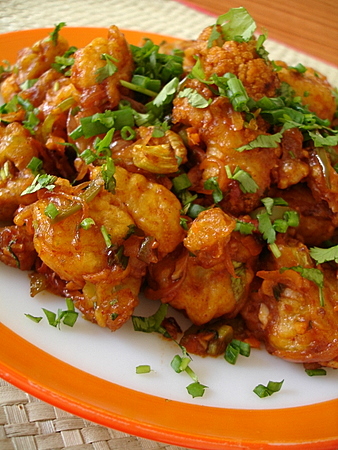 This recipe comes after a couple of trials to achieve that restaurant style ‘Gobi Manchurian’. In fusion cooking there are no rules to follow. You will find assertive notes of spice and tang, a generous dose of garlic, green chilli, ginger and garnished with lots of spring onions and coriander leaves – in other words, simply flavorful! It does take some time to prepare but its worth the effort. 1 Heat oil for deep frying in a heavy bottomed vessel. 2 In a bowl, combine maida, cornflour, rice flour, salt, ginger-garlic-green chilli paste and water to make a thick paste. Dip the washed and drained florets into the batter such that its well coated. Place each floret that is well coated with the batter into the hot oil. Do not crowd the vessel. Reduce flame and deep fry till the gobi is almost cooked. Increase the flame towards the end of the cooking process and fry the gobi till it turns golden brown. Remove onto absorbent paper and keep aside. 3 Heat oil in a large wok and once the oil is piping hot, add the chopped garlic and stir fry for a few seconds. Add the green chillis and ginger and stir fry on high for a few seconds. 4 Add the whites of spring onions and stir fry on high for 3-4 mts, constantly tossing them. Add the sliced capsicum and stir fry for another 3 mts. They should retain their crunch. 4 Reduce to medium heat and add the brown sugar, soya sauce, tomato ketchup, chilli sauce and vinegar. Combine well and cook for 2 mts. Add 3-4 tbsps of water and cook for 2 mts. 5 Add the deep fried gobhi and combine. Toss on high flame for 1-2 mts. Turn off heat. Garnish with the chopped spring onion greens and coriander leaves. Lovely recipe. Thanks a lot. Thanks Sailu for ur wonderful recipe…da picture is looking very gud. Your welcome. Happy Sankranti to you and your family too. Thanks Sailu for the recipe, I have tried making Gobi Manchurian a couple of times earlier. They always turn out soggy. I will surely try this out and let you know the results. Happy Sankranthi! Your welcome. Happy Sankranti to you too. Hello Sailu…. 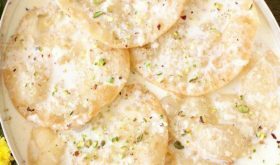 gr8 recipe and gr8 pics as usual… planning to try this pretty soon. Where did the Ghee come from in step 1 (Do we use ghee in Manchurian recipes? ), as I could not find it in the list of ingredients. In step 5 you said, Add the fried gobhi and combine… but when do we need to fry the gobi… (Did you say that before…I could not find that)…. can you please clear these doubts…. Wish you a happy Sankranthi….and are you putting Bogi pallu for your son Nehal (he is just 6 years old right)???? Updated the post and corrected the typos. Happy Sankranti to you too. No, we did not do the Bhoghi Pallu ceremony this year. Beautiful clicks Sailaja. Looks delectable. I am in the middle of a server move hence the error. Sorry for the inconvenience caused. Hopefully things should be fine in a day or two. looking yummy. i love gobi manchurian. i am sure ur recipe will definitely be tasty. Tried ur recipe…it was grt hit with my family..Thanks a lot. Lovely pic !! So tempting!! Will definitely try once. Classic Indian Chinese! All my wishes for a fantastic 2009. Sailaja, I just tried your recipe and it came out very well. Thanks for sharing. thanku sailaja for ur reply…i didnt see ur reply im out of station…i saw ur udipi recipe thanks alot!!!!!!! This recipe looks great and very simple. I’m going to give it a try with broccoli. I can eat a whole bowl of this!!! It is really superb. I made it!!!!!!!!!!!!!! ur recipe is cool… even the people of mongoloid clan living in manchurian region in china will get addicted to this lovely indianised stuff. It became a must once in a week in our kitchen’s weekly diet sheet. Thanks sailu for the wonderful recipe ….i tried it today and it was delicious. Thanks sailu for the wonderful recipe ….i tried it today it was delicious. once again thanks a lot. Hello Sailu, I googled for a good gobi manchurian recipe and I landed up in yr blog to see yr recipe.Im 22 yrs old and very fond of food,especially Indo chinese.I have also checked out yr other recipes like veg pulao wth soya chunks and yr noodles with spicy garlic sauce.I will try each one and give u my feedback.Im the first time viewer of yr blog and Im truly very impressed with all yr cooking experiments.I hope I follow yr recipes and become a foodaholic!My best wishes to you and keep cooking yummy dishes like these for all of us!!! Hello Sailu, I googled for a good gobi manchurian recipe and I landed up in yr blog to see yr recipe.Im 22 yrs old and very fond of food,especially Indo chinese.I have also checked out yr other recipes like veg pulao wth soya chunks and yr noodles with spicy garlic sauce.I will try each one and give u my feedback.Im the first time viewer of yr blog and Im truly very impressed with all yr cooking experiments.I hope I follow yr recipes and become a foodaholic!My best wishes to you and keep cooking yummy dishes like these for all of us! Hi sailu ,Really useful & delicious stuff. Your picture itself make everyone to try the recipe. I tried ur reciepe and its very very tasty. I would like to try Veg manchurian too.. Please post it.. I like your receipes very much. I tried few of them and planning to try lot more. heyy aunty -tried this recipe worked out awesome!!!!!! as always u hv a great website here – we use it all the time kudos to you ! i have corn starch,can i use it instead of corn flour?is there any difference between them? thank u for ur great recipes,i tried ur vangi bath and it was awesome. The recipe is nice. the picture looks very nice. sakshi paper is publishing ur recipes and pics every day. are you publishing ur recipes in sakshi? anyway nice recipes. No, I am not publishing my recipes in Saakshi newspaper. They are using the content/images of my blog without my permission. I tried your Gobi manchurian.It tastes so good.I am following your blog and mahanandhi from past one year.But, this is the first time i tried your recipe.This inspired me to try other recipes too.I am very particular for not using the ajinamoto and food color. Even without using these, the Gobi manchuria looked and tasted so good. i tried the gobi manchurian recipe.it was a blast. thank u so much.wanna try again.great thing was the pictures of ur recipes are awesome…..everyone feels like trying the recipes.ur blog was a big hit. I am new to your blog.i love indo-chinese dishes.i tried your Gobi manchuri,it turned out very well.thanks a lot for sharing.I sure want to try your other recipes.Please,can you send more vegetarian indo-chinese recipes. hi sailu, i like manchuria, suparo super. I have made manchurian once before and it was an oily disaster. Your recipe is amazing. As you say, though it is slightly time consuming (and a bit of cleaning up as well) it is all worth the effort. I don’t think i’d ever go back to eating manchurian from a restaurant. also made fried veg noodles to go with. both were fantastic. thank you a lot. I am going to make this on my son’s first birthday. Eenadu paper lo meeru post chesina article lo nunchi mi blog chusanu. So i checked using that address. Mana telugu vallu adi vizag ani chusi chala happy feel ayyanu. 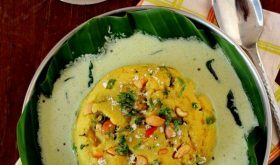 neenu net lo chala sarullu recipes chusannu kani mana telugu valla di first time. Mi recipes ani chala bagunayi .will start trying all ur recipes. Mi blog chala bagundi. Can you advice whether I can use the same recipe for chicken manchurian as well……. if yes, what are the changes i would need to make? While making chicken manchurian, add an egg white along with corn flour-maida-g-g-g paste base. Add minced boneless chicken, pepper pwd, soya sauce and add few tbsps finely chopped cabbage (optional). Avoid water. Combine all the ingredients and make small balls and deep fry to golden brown shade. Follow rest of the recipe. Hope to blog the recipe soon. Thanks a ton for such a prompt response… you are really an angel…….. I tried your manchurian recipe with chicken as per your advice and result was just fab……… everyone simply loved it especially my brother… Thanks for making our lunch special.. 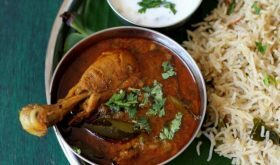 Simply supur……Nennu mee recipe ni try chysanu…maa papaki chala baga nachindi..thanks. I truly admire your patience to put up such a wonderful blog. I don’t know how many people I’ve recommended your blog to. The manchurian looks ready to be eaten straight from the website. Thank you. Wonderful recipe. VINODA. Yummy looking dish. I made it today with few variations. Will post the variation in my blog soon. Thanks. Just tried making it and it works! Thank you so much, it’s yummy! Does tomato sauce mean ketchup? You can use tomato ketchup. Yummy!! 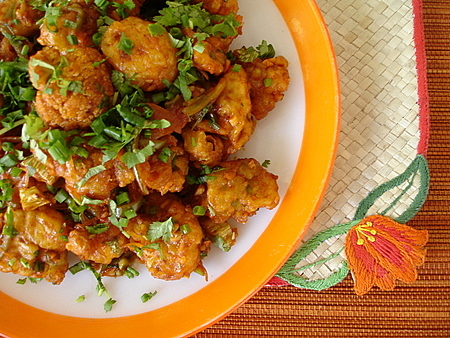 I made this gobi manchurian today, and it is a bit hit at my house today.. Your recipe is simply amazing. It turned out great. Our family loved it!! And we are making it tonight!!! BTW for all of you in Palm Beach-Broward, go to Boy’s Farmers Market in Delray Beach, they have the best produce!! I hv tried this recipe today and it turned out pretty satisfactory.Thanks for the your good work. I loveeee it….. thanks a lot.. I am an amateur person to cook and moreover I don’t even trust my taste buds.. but everyone loved it..
when should we add chilli pwdr? Add it along with soy sauce, tomato sauce etc. hai, iam newly married. and i tried this, it is such a superb dish…. we love it. can you please guide me to prepare Vegetable biryani?? 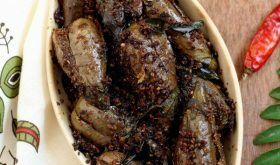 How to make Ginger garlic green chilli paste.I need the measurements plzz. Take an inch of ginger, 5 cloves garlic and 2-3 green chilies. Add little water and make a paste. What I usually do is make ginger garlic paste and store in refrigerator. I make fresh green chili paste when required. If a recipe calls for 1 tsp of ginger-garlic-green chili paste, use 1/2 tsp of ginger garlic paste and 1/2 tsp of green chili paste. I also make ginger green chili paste. Take a cup of peeled and chopped ginger and 15 green chilies. Blend to a paste. Add a tbsp of lemon juice and 1/2 tsp salt and store in an air tight container. Place in freezer. Thaw before using. I put in a search for Gobi Manchurian and I landed on your website. I read the receipe and found it interesting as conmpared to otehrs and that evening I made Gobi Manchurain for dinner and it was yummy. My family loved it . Thank you Sailu for sharing the receipe. I tried this recipe and surprised my wife when she came from work! It came out lip smackingly great. Thanks for posting it. Thank you for this recipie and it came out really yummy!! Quick question: I cooked this and the sauce made the crispy fried Gobi a little mushy. Is this intended, or didn’t I do something right? Also do you put the Gobi in hot water for ten minutes to remove the bugs, or just to make it a little softer? The sauce will make it lightly mushy. If you want to retain the crisp texture of the gobi, reduce the quantity of water and corn flour the next time you make it. I placed gobi in hot water to remove the bugs as well as lightly soften the florets. Hope this helps. What is cruch?? I think may be you need to check back after what you write. I don’t think we really need a cruch for making a refreshing drink. wow, this is excellent. I followed the directions exactly except added less chillies and this is so good- just like from the restaurants. Thanks so much for the wonderful recipe! Tried this recipe. It’s wonderful. Delicious!!! Tried this for a pot luck event yesterday and it was a super hit!!!!! Thank you for this awesome recipe. Hi Sailu, I am definitely going to try to make it today evening. However, the “chilli sauce” you are referring to, is it the green or red chilli sauce. I am asking because I know there is a green colored chilli sauce in Indo-Chinese cooking and there is a lot of red colored chilli sauces as well. It will be great if you reply to my question. Thanks a lot! very nice recipe. Tried it as is. Came out very well. I made a couple of changes xoz I didn’t have all the ingrediants. I finely chopped onions instead of spring onions and used besan instead of corn flour. Probab the spring onions wud have added extra flavor to this dish. Excellent recipe nevertheless. very nice recipe.Thank you… fan of your blog! Wonder full recipe .. Thanks for posting… Very Soon I’ll try this. But I have one small doubt like is that necessarily to use vinegar and black sugar or we can subtract and use normal sugar as a substitute…Please reply…. My husband’s coworker brought a similar gobi dish to a potluck, and we were in love! We made this for dinner tonight, and it was even better than his gobi! DELICIOUS! Tried this – came out great – the only thing my husband says he likes it with more gravy. ANy suggestions? Add a cup of water and bring to a boil. Add a tbsp of corn flour to 3 tbsps water and slowly add this to the cooking liquid. Keep stirring and the sauce will thicken and you will have a thick gravy. Got hooked on your site after trying the Kheema Curry recipe. Have just one suggestion: Wd be great if you could list the ingredients in order of use. For e.g. when the recipe says to add the brown sugar, soya sauce, tomato ketchup, chilli sauce and vinegar, one is expecting to find them listed in the ingredients list in that same order. Thanks for all your work. Great! I tried it today and it was awesome! nice recepie.. Thanks a lot!! 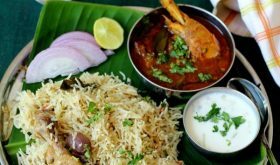 Your recipe is too good.I just followed it as it is and the manchurian came out very well..Appreciate your quality work and the idea to share with others through the blog is awesome ..
Thanku soo much….the dish turned out really awesome!!! !